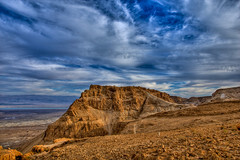 There are over forty national parks in Israel ranging from archaeological sites such as Caesarea National Park and Masada to sites of natural beauty such as the Carmel National Park. With so many parks to choose from, which are the ones that a tourist should try to find time in their itinerary to experience? In this article, we will list five of the best national parks in Israel to visit. Caesarea National Park, located on Israel’s Mediterranean Coast, is an ancient port city created by King Herod the Great. Extensively excavated, the port has been largely reconstructed, as have many of the buildings which house exhibitions, amazing audio-visual displays, and cafes, restaurants, and galleries. The ancient amphitheater at Caesarea hosts numerous concerts every year in its amazing location alongside the Mediterranean, and there are regular events at the port throughout the year. Read more: Caesarea National Park. Ein Gedi is an oasis, located just west of the Dead Sea, and north of Masada, in the Judean, Negev Desert. 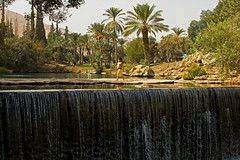 The nature reserve sits adjacent to the Ein Gedi National Park and features an oasis, spring, and amazing walks through greenery amid the desert. Amazing plants and animals inhabit the area, and The National Park itself features several archaeological ruins, including a Temple and 2,000 year old village. Read more: Ein Gedi National Park. One of the largest archaeological sites in the world, Beit Shean has for thousands of years been an important place due to its location where the Jezreel Valley meets the Jordan River Valley. If you are interested in archaeology this is somewhere not to miss with hours of excavations to occupy you spanning millenia. The site has sound and light shows and an amphitheater which is used for concerts.